PCCP would like to welcome Anouk Rijs as our newest Associate Editor for 2016. 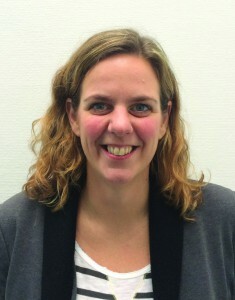 Anouk Rijs currently holds a position as Assistant Professor in Molecular and Biophysics within the free electron laser laboratory FELIX of the Radboud University (the Netherlands). She has a PhD in physical chemistry from the Free University in Amsterdam. Subsequently, she worked as a post-doctoral researcher for professors Mattanjah de Vries (University of California Santa Barbara) and Wybren Jan Buma (University of Amsterdam). As a NWO-VENI fellow at FOM Institute Rijnhuizen (now DIFFER) she developed novel instrumentation and interfaced this with IR free electron lasers. She is an expert on IR action spectroscopy for the structural characterization and conformation dynamics of peptides and continuously pushes the boundaries of current research in IR action spectroscopy. At Radboud University, she recently has developed a research program on the far-IR/THz spectroscopy to probe soft vibrational motions which are directly related to the secondary structure of peptides and peptide aggregates. Dr. Rijs was co-editor of an edition of Topics in Currents Chemistry (Springer) entitled “Gas-Phase IR Spectroscopy and Structure of Biological Molecules”. In 2014, she was awarded the Mildred Dresselhaus Guest Professor award for her work in physical chemistry specializing on the investigation of biomolecular systems using IR and THz radiation, and with the FOM Minerva Award 2015 for best physics publication of the last two years by a female lead author. On behalf of Dr Rijs and the rest of our Editorial Board, we would like to invite you to submit your best work to PCCP.